On 16th May, the ladies of Chevron TM powered through London to raise money for breast cancer charities as part of the Walk the Walk programme dedicated to the fight against breast cancer. Walk the Walk came into being 19 years ago when just 13 women Power Walked the New York City Marathon in their bras to raise money and awareness for breast cancer. What started out as a one-off fundraising event, has blossomed into a thriving multi-million pound charity, raising to date in excess of £99 million for vital breast cancer causes. 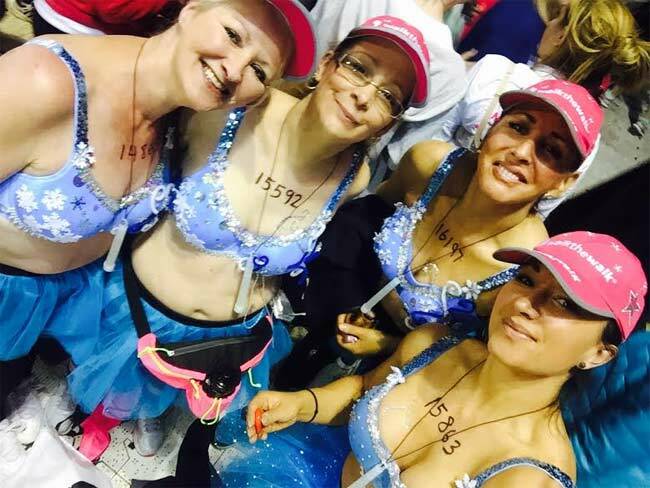 Battling the 26.2 mile course, as well as the less than favourable London night temperature, Alison Sawyer, Louise Donaldson, Jo Hudson and Lisa Killinger of Chevron did their bit for the fight by shedding their coats, donning their bras and marching through the capital. Having raised over £2,500 on their fundraising page (which can still be given to generously!) it’s safe to say the ladies have done themselves, and Chevron TM proud for raising so much money, and so much awareness for a fantastic cause. Chevron have a history of setting themselves a challenge or 2 for charity, and can count London to Brighton walk 100km challenge and the Three Peaks Challenge among more of their recent accomplishments in the name of good causes.